Discussion in 'Regulated Mod Reviews' started by Timwis, 11/2/19. 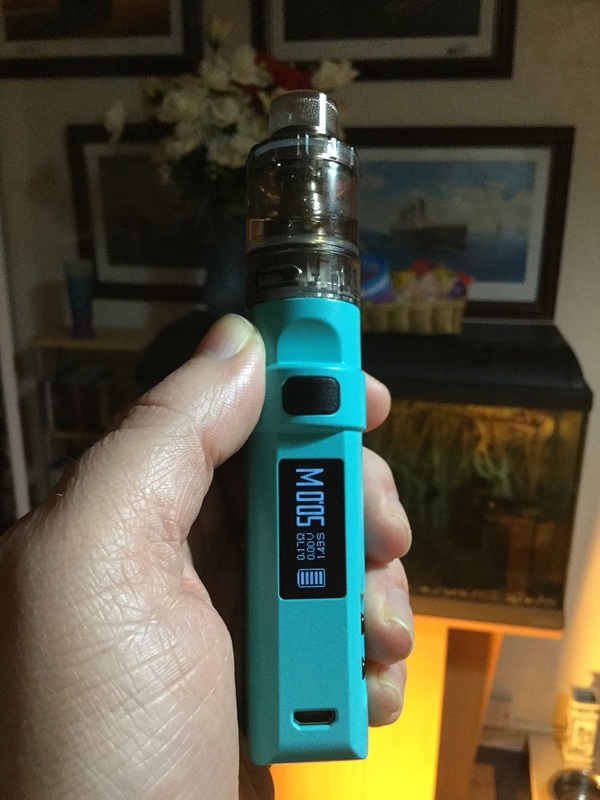 Hi Ecigssa members, In this review i take a look at the REX 80W TC Kit with UFORCE Tank from Voopoo. The REX 80W TC Kit with UFORCE Tank was supplied for the purpose of this review by Thea from Voopoo. Voopoo are mainly known for the Gene chip and a number of dual battery devices, the Alpha One, Too, Vmate and most notably the Drag devices. 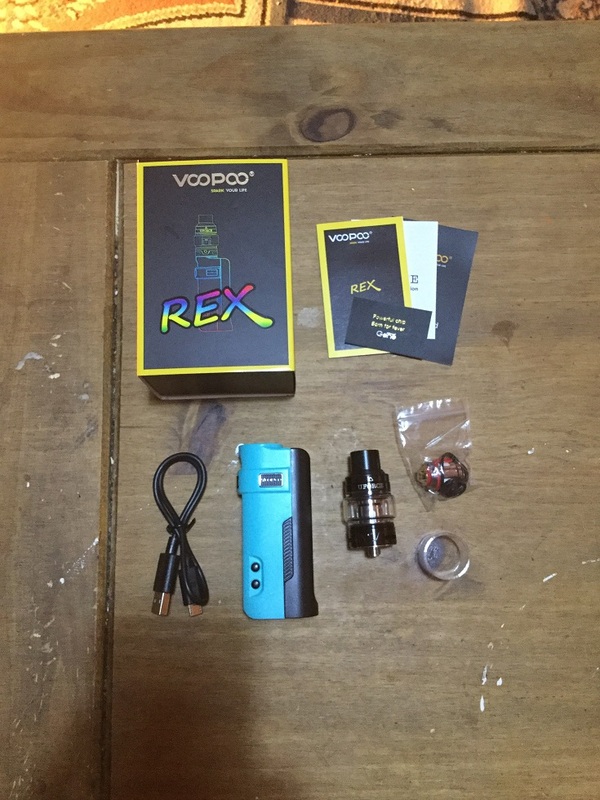 Here we have a single 18650 device the Rex, powered by the new Gene.Fit chip and including the Fit feature the Rex in this kit is accompanied by the Uforce Sub-ohm Tank, I give my thoughts! The Rex kit came in the usual cardboard box with outer sleeve packaging that Voopoo kits come in. On opening i found i had received the Blue version which actually looks Cyan, it comes with a Black Uforce tank. Other versions the Rex is available in are Black, White, Red, Orange, Darkcyan (which actually looks like Lincoln Green) and Olive, despite the Uforce being available in a few colours all versions come with a Black tank. The Rex is a very slim device due to the battery being fitted into the spine of the device which seems to be a space saver has most of my smallest single battery devices have the battery fitted this way. The front of the device has a raised band that also extends around the sides towards the top, housed on this is a small (relative to most fire buttons) rectangular Black fire button. Central on the front of the device we have the screen with tinted cover, then at the bottom is the micro USB port. The sides of the device are mainly the colour of choice but towards the back is the Black battery panel, where the main chassis meets the panel halfway down on both sides is a narrow textured strip to help with the removal of the panel. On one side towards the top we have a little Black plaque with Silver edging and "VOOPOO" central also in Silver, further down towards the front of the device we have an indented section which houses the 2 small Black navigational buttons. The spine of the device is the Black battery panel, then moving to the base we have printed safety marks and generous venting. Up top towards the rear we have the top of the battery panel visible then at the front is the 510 plate on a raised platform, the 510 is Gold plated and Spring loaded. The slim shape with rounded edges make the Rex very ergonomic and it has quite a unique form achieved by the 510 plate protruding at the front of the device but the rear tapering inwards, on the base of the device we have the opposite with the front being tapered but a protruding back end. The build quality is very good and the finish seems durable. 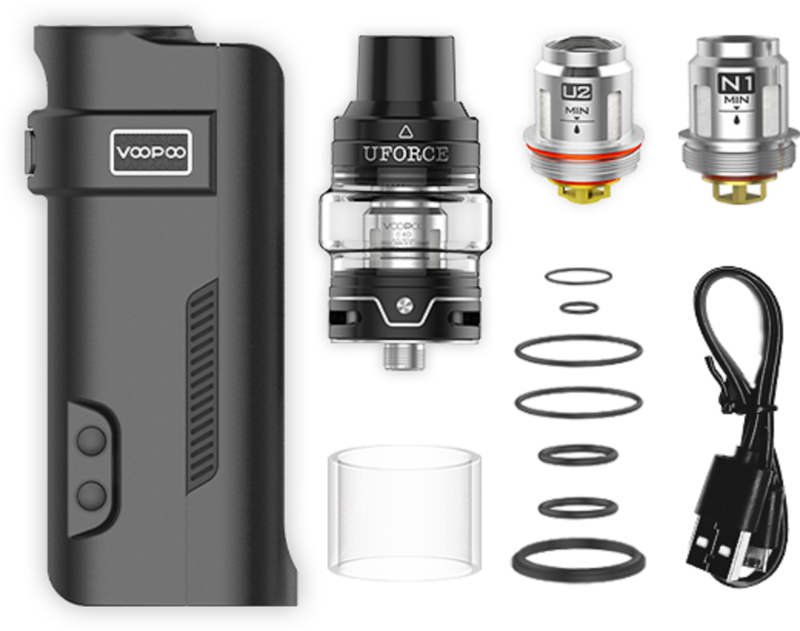 I have reviewed the Uforce before, this version and the Uforce T2, but here is a quick look at the Uforce sub-ohm Tank which there will be many reviews out there for. The Uforce is a very good sub-ohm tank and not just a kit tank, i received the standard version which is 24.6mm in diameter (28mm around the bulge glass) and has a capacity of 5ml. The TPD version is also 24.6mm in diameter but shorter and comes with a straight 2ml glass section plus spare, the standard version comes with a spare 3.5ml straight glass. All the threading on the Uforce is excellent and the tank can be taken apart and reassembled very easily. It has a tri bottom airflow and has a top-fill system, the top just needs pushing where it is clearly marked and it slides open revealing a generous fill slot. You receive 2 coils which are the pre-installed U2, a dual 0.4ohm rated at 40w - 80w with a best of 55w - 65w, this coil seems to be the coil pre-installed with all versions of the Uforce when included in a kit so i have used it a few times and i find it best at 60w which gave above average flavour, maybe not quite up there as some of the mesh coils of late but excellent for a standard stock coil. The other included coil is the one i used as i haven't tried it before, it's the N1 single mesh 0.13ohm rated between 50w - 100w with a best at rating of 70w - 80w. The single 18650 battery is fitted via the battery panel which is the spine of the device. Their are textured strips either side of the device where the main chassis meet the panel. I am pretty sure these textured strips are just cosmetic but as they are slightly indented putting your fingers in these do allow to get a bit of edge of the panel to help in it's removal. The compartment is neat and the battery is a tight fit but both contacts are rounded (so no issues with damaging your wraps) and their is a ribbon for easy removal. The panel secures via magnets top and bottom and once in place is very secure with no movement whatsoever. The only issue i have is the usual why can't the orientation be in White? The Display is sharp, it's also bright indoors but has a tinted screen so could be issues with visibility on a Sunny day (something that i can't test as it's the beginning of February in the UK) , it's old school only giving the information really needed. To the left of the display positioned vertically we have the battery status bar, next to this is resistance top, underneath is voltage which changes to watts when in temp control and at the bottom seconds vaped. The right hand side of the screen displays wattage or temperature and mode information. The Rex is the usual 5 clicks of the fire button to turn on and 5 clicks to turn off. Once on navigating the device is a bit strange compared to most devices but partly because the device isn't packed with features once you get use to it navigating is easy, if you have previous Voopoo devices you will be familiar to how it works. 3 clicks of the fire button takes you to where you can choose between SS, TI or NI temp control wires, a further 3 clicks takes you to Fit mode which i will explain in a later section, a further 3 clicks takes you back to wattage. When in wattage mode pressing up and down together brings up some options which are, Wattage (takes you back to standard wattage), M1-5 takes you to the main screen in memory mode, SN (displays serial number) and Vers (gives firmware version). When in temp control pressing the up and down together gives you different options which are, TC (takes you back to the TC main screen), M1-5 (memory mode for TC), lock resistance and enter TCR value. When the memory screen is on pressing fire 4 times takes you to where you can set a custom curve, 4 presses of the fire button in temp control allows you to set wattage for temp control up to 80w. Finally their is a couple of combination button press features, first up and fire together locks and unlocks the device, when the device is locked it will not fire and down and fire together flips the screen. Fit Mode is the feature on the device that Voopoo seem to be really pushing to the point that even the updated Gene chip has been named the Gene.Fit. As far as i can tell from playing around with the Fit feature it's a smart feature that reads the resistance of the coil and gives appropriate wattage, nothing new there as this feature is common to many devices. The difference with the fit feature is that you have 3 levels 1, 2 or 3 so you can get 3 different wattage's for the coil, essentially it gives you a soft, medium or hard hit so Fit Mode seems to be a combination between Smart mode (as seen in on many recent devices) with different preheats or maybe even just different wattage's. When using the Fit feature you are on the fit screen where you highlight 1, 2 or 3 and vape, the device doesn't actually give you information about what wattage that is being applied it's all very mysterious which leads me to think it is what i described just soft, medium or hard preheat along with smartly giving appropriate wattage or even giving appropriate wattage and then just giving higher wattage settings on 2 and 3. Combining smart mode and preheats (if that's actually what has been done, if you know different please spill the beans) actually isn't a bad idea and some people will like Fit mode even if the innovation is combining 2 different already common features together rather than anything actually new. As always i must point out i do not vape in temp control or have access to data so simply review a product as my own vaping experience using it. The fire button although quite small is very easy to find situated on the raised band on the front of the device and is nice and clicky. The Gene chip does it stuff with the device firing instantly with no noticeable ramp up, still impresses even if their is a lot of good chips around now. 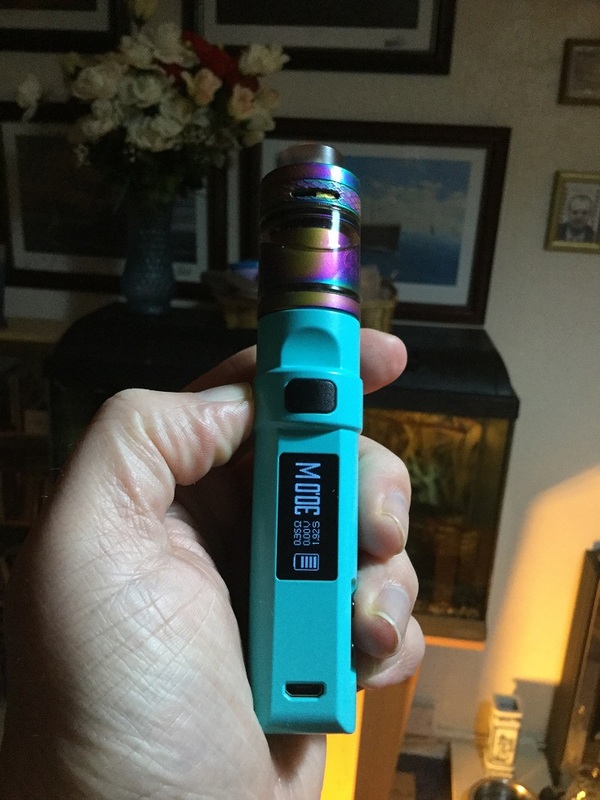 The fit mode just isn't for me as i like to know what wattage i'm at and much prefer dialling my own in but i'm sure some will like it, the curves i do like trying on a device and they work well on the Rex. I used the Rex with the supplied Uforce tank to try out the N1 mesh coil and the flavour is very good but i found i needed the device on the full 80w which just drained my battery in next to no time. I then tried the tank on another device and it's a good coil but not for this kit. If the Rex was using a 21700 battery and was a 100w device it would just be ok but including a coil rated up to 100w with a best between 70w and 80w with a single 18650 device seems like no brain cells were functioning when the decision was made. 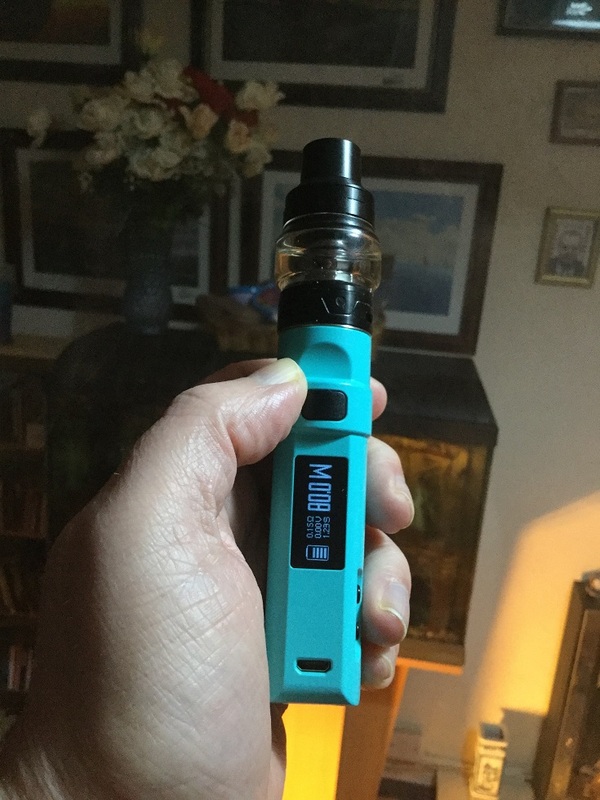 I also used the Rex with other tanks and it's an ergonomic very good single battery device so have no issues rather than thinking it was a missed opportunity to go the 21700 route and when setting wattage it does scroll quite slowly. Although the inclusion of the N1 coil is a big mistake in my opinion the Uforce is a very good tank and their are plenty of other coil options for it. The Rex was obviously designed with the Uforce in mind as the 24.6mm diameter tank sits absolutely flush, other 24mm look really good and you could get away with 25mm but with the 510 plate being on a raised platform that protrudes at the front of the device any tanks with overhang are going to look terrible. The battery life is as good as i would expect from a single 18650 device, the Rex is also fully firmware upgradeable. I would once again like to thank Thea from Voopoo for supplying the REX 80W TC Kit with UFORCE Tank for the purpose of this review.